Lately, I've been trying to finally update the behavior of the ObjectForms Demo application on the Honeycomb tablet and one of the missing pieces was support for the ActionBar, the new feature of Honeycomb. Well, not that so new feature. ActionBar was promoted by Google engineers (such as this one) even before Honeycomb was published. 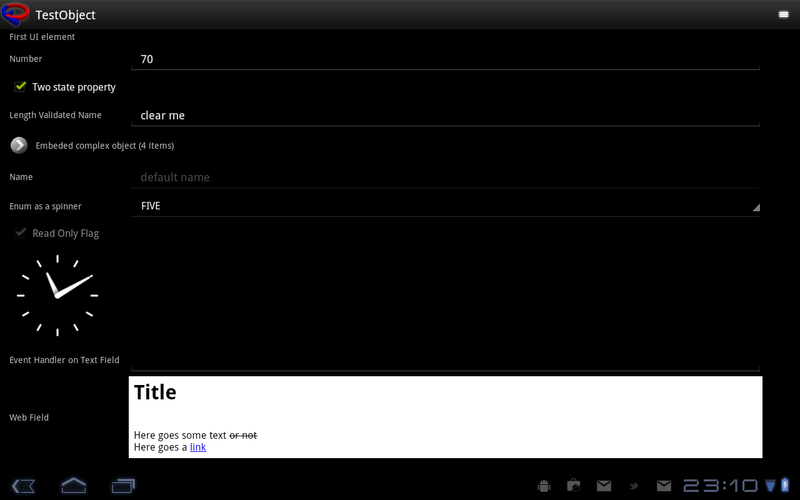 As many other app developers, ObjectForms tried to be a good Android citizen and followed the Google provided advice, so there is a custom implementation of the ActionBar related functionality for a quite some time and I thought since I crafted my interface to look similar to actual Honeycomb API so I thought this will be piece of cake. Neither ActionBar documentation nor the ActionBar developer Guide gave any relevant answers. I learned some interesting aspects about the ActionBar design. 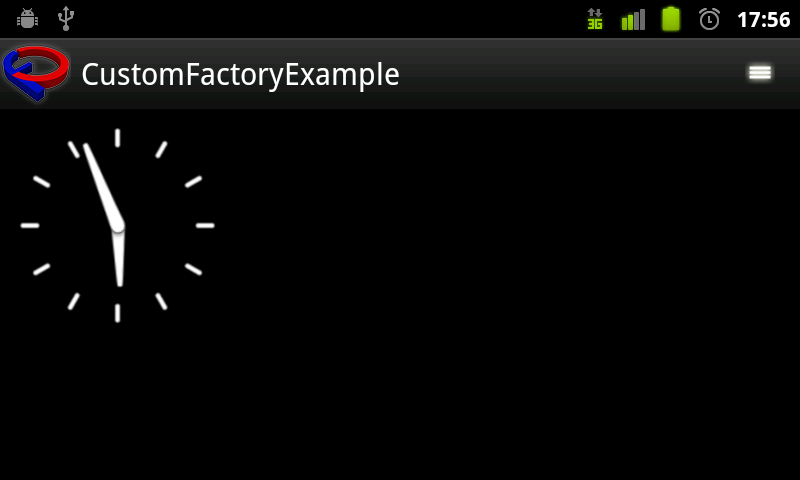 First, documentation says that if the ActionBar is visible or not, is controlled by the changes of (!!!!) visual theme ! WOW, that's example of very bad engineering. Sure I did try to apply the correct theme, but it made no difference. Second thing that I found very unusual was the fact that ActionBar, although very visual component itself, able to contain other visual components (tabs, custom components etc.) is not part of the visual hierarchy and is not descendant of View class, but rather just plain Object. It made no sense to me. was doing nothing, although it worked perfectly well on the Gingerbread and earlier Android devices. Hm. Typically, I would explore the Android source code to see what might be the reason for that unusual behavior, but Honeycomb is not quite open source ;-( so I was out of luck there. Seems I hit the wall. Make sure that title of window is visible if you want to show the Honeycomb ActionBar ! Since I believe most developers face the similar scenario I had, they have their own implementation of the ActionBar for Gingerbread and as the result they had a window without the title, the solution Google has for the Honeycomb is extremely unintuitive. Glad I found a solution. Not only this, but to my surprise I found that openOptionsMenu() started to work as well. That's amazing ! But I was still not done. As you can see from the picture above, the first version had both native Honeycomb ActionBar and the custom Gingerbread one. I wanted to reorganize my code to be more reusable and in middle of this I realized the ActionBar is gone again, the getActionBar() is returning nothing again. But I was able to track my changes, so it didn't take long to figure out what is problem this time. I tried to create my visual hierarchy first and expected that getActionBar() will tell me if I have native HoneyComb ActionBar or not. But this method is useless, as it assumes setContentView(view) has already been called. Since I was just constructing that view, this was not the case. Of course, this is another quite important aspect never mentioned in the documentation. Hey Google, if your code requires the contract, and you are not able to enforce it by API design, please do us a favor and let us know about the contract ! 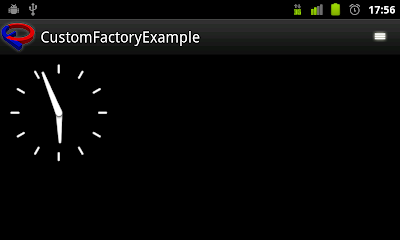 Make sure the setContentView(view) has been already called for your Activity, otherwise getActionBar() will return null. Just to make the story complete, I wanted to have the look of the native ActionBar to be similar to previous version, and wanted to replace the logo with one that doesn't look as been a part of the button. I was not shocked to learn that customization is possible only in form of replacing the XML attribute "logo" with a custom value, and there is no corresponding Java API for that. It is still not clear to me why ActionBar is not descendant of View and why it is so difficult to deal with it, but apart of that, all the mystery has been solved. If you target Honeycomb in the manifest, you need native ActionBar to be at least hidden, otherwise there is no way to show the option menus. Hope you find the information mentioned in this post useful and hopefully they can save you some head-scratching time I had recently. Thanks so much. Solve my force close issue. This article saved me a lot of time! wish i had read this earlier...thanks! This solved my problem. Thank you!